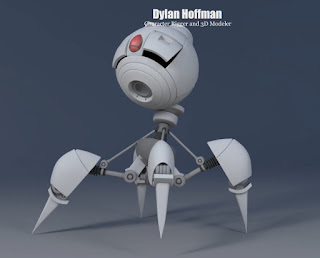 Brien Hindman is an environmental modeling supervisor at Disney Animation and an Instructor at one of the best 3D animation schools-- AnimSchool. Previously, he was a senior modeler at Blue Sky Studios as well as the environmental modeling lead for Ice Age 3. 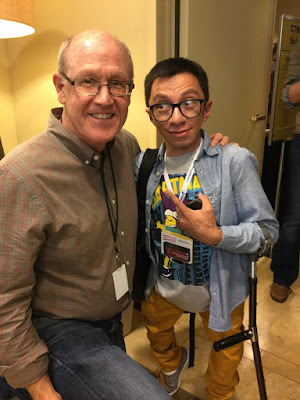 Films he has worked on include: Moana, Big Hero 6, Frozen, Wreck It Ralph, Epic, Ice Age: Continental Drift, Rio, Ice Age: Dawn of the Dinosaurs, Horton Hears a Who!, Ice Age: The Meltdown, and Robots. As he himself is one of the many modelers at Disney who watches incoming demo reels on a regular basis, he gives his students lots of advice about the best, most effective ways to create their demo reels. Despite being a very busy guy, Brien agreed to share his insight with all of our readers. What are the guidelines you tell your students when making a turntable? Be sensitive to screen time. Remember that professionals are looking at your work, and they can tell within a few seconds if it’s good or not. It’s important to keep the energy of a demo reel up, so you don’t need to make the turntable excessively slow. Generally about 3 rotations within 5 seconds is enough, which includes almost a full rotation with the wireframe comped onto the model. Start the turntable almost a full second before the most important side of the model, which typically includes the face. This gives you time to cross dissolve from your previous model, as well as giving the viewer enough time to figure out what she or he is looking at. It’s a bit annoying to have to wait a full second to see the face, but I’ve seen many turntables that start out on the face, but includes a cross dissolve, so we are essentially seeing the backside of the model first. It’s a good way to kill the moment of the demo reel. Further, end the rotation in a smart place. It doesn’t have to be where you began it, but you want to leave the model in an interesting place. It makes a better impression. Generally, 2 seconds or so per rotation is good, but it really depends on the model. I would say 4 seconds is pushing it in terms of speed. In general, what should a good modeling demo reel look like in terms of length, variety, and number of models? Longer demo reels do not constitute better demo reels! It’s better to make a shorter, stronger demo reel that is 1 minute long than pad it with an additional minute of mediocre work. Don’t overstay a model’s welcome. You’ll only annoy the professionals. Remember, they have a dozen others to get through, as well as get back to work. You’re not fooling anyone by making the demo reel by including that crane up rotation in addition to the standard demo reel rotation. Consider who you are sending the demo reel to. Your demo reel is a commercial, as well as an extension of yourself. Variety is usually good, as it implies you are willing to work on sets as well as characters. Further, different styles show you are adaptable and have a good eye. From one project to the next, the style can be very different, and an employer will want to see you can produce from show to show. In general, I tell my students they should include a variety of body types, genders and styles. A hyper real character is good to include as well, but if it’s a feature animation studio, they won’t want to see an entire demo of hyper real characters. Conversely, a video game studio won’t know what to do with stylized cartoon characters for the most part. Environments are important as well. An interior with plenty of scale cues is a good choice, as is a stylized car if it’s for a animation studio, real otherwise, as well as an exterior organic environment. Making trees is hard. Most people are terrible at it. Hard surface is good to demonstrate as well, but that is usually covered by the interior. What makes the best arrangement of models, for example should the best ones be at the beginning, the end, or a little of both? Many people have different opinions on this matter. I think best first, second second and third last is best. You may only have 10 seconds to get someone’s attention before they move on to the next demo reel, so it’d be a shame if they never saw what you consider to be your second best work if it is last. That said, you want to end strong and leave a good impression. The third best model is generally enough to do that. Should our modeling reels differ depending on the studio we are applying for? If yes, how so? Yes. In addition to what I mentioned, consider each prospective employer a client. Said employer generally is not going to want to think outside of the box. If they can directly apply your skills to their needs, you will have a better shot. You guys look through hundreds of demo reels all the time and I’m sure they all start to look the same. How can we make ours stand out from the rest and be remembered? Follow everything above. Generally, HR screens the demo reels for us, and then we look at the top picks. You have a lot of hurdles to get over, so if the demo reel is entertaining from beginning to end without music, then you have a good shot. An easy way to stand out is to not build the same kind of characters or models as everyone else. Anime characters with giant swords are generally a good way to be forgotten. Everyone does it. What are some common mistakes that you often see people make in their modeling demo reels? They add music. They don’t show wireframes. They add models that they shouldn’t have added that aren’t nearly as good. It shows a lack of judgement in that case. Remember you are saying you think these models are the very best you can do. If you don’t think it’s the very best, then don’t include it. Don’t model well known 3d characters. Someone with more experience has already done it, and so you are inviting a comparison between someone with 15 years+ experience and yourself. Make your demo reels as modular as you can, so you can drag and drop turntables in with as little effort as possible. The more customizable the demo reel, the better you can tailor it for a prospective employer. In this clip from a class lecture of "Introduction to Maya," AnimSchool instructor Justin Barrett talks about rotation tool and how to effectively use its gimbal mode. 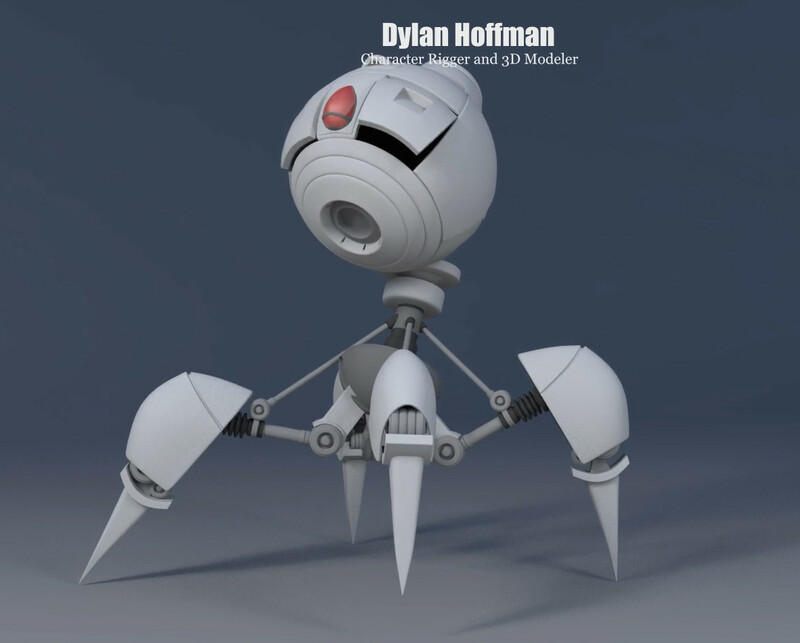 Former AnimSchool student Dylan Hoffman was incredibly fortunate last year to have had the oppurtunity to intern at not just one, but two of the industry's most well-known studios, Walt Disney Animation Studios and Lucasfilm. We were fortunate enough to catch up with Dylan and ask him about his experiences. 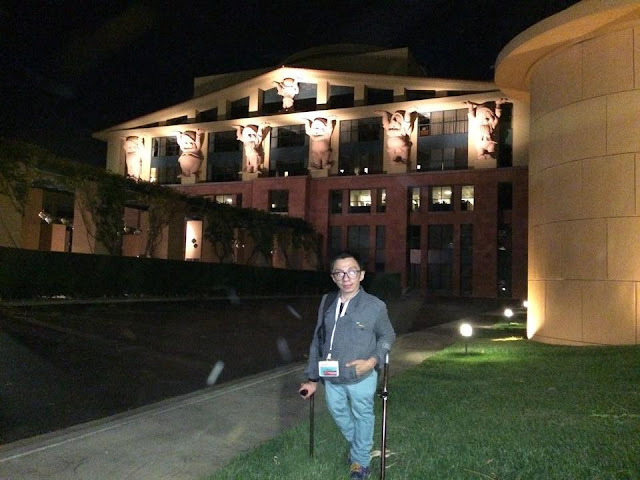 How did it feel the moment you got your first internship at Walt Disney Animation Studios? I honestly couldn’t believe it. I just got a phone call out of the blue one day offering me the position. Obviously I was over-the-moon excited, and the feeling never left. Everyday I woke up I felt just as lucky and excited to be there as I did during that first phone call. I STILL feel incredibly lucky to have gotten the chance. 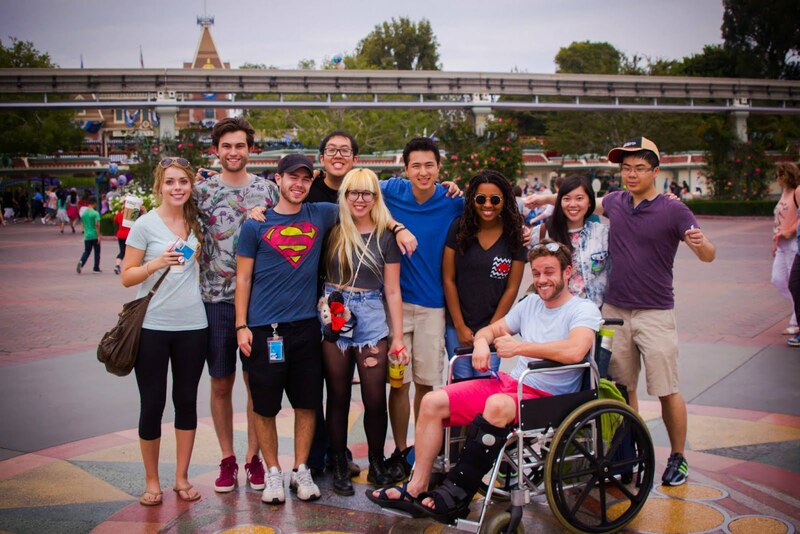 What was a typical day like for a Disney Intern? I was on a team with 10 other interns, all from different schools and backgrounds. It was structured as a learning experience more than anything else, with different “classes” each day where we met with members of different departments to learn more about the whole 3D pipeline. Throughout the process we also worked together to make our own short film. I helped with modeling, rigging, and animation, so my “typical day” was filled mostly with working on the film in between class. Was that very different from a typical day as an intern at Lucasfilm? Very much so! While Disney was a structured internship program, with scheduled tours, trainings, and much more focus on us and our learning, Lucasfilm was, simply put, a job! Still an incredible opportunity, but from day 1 I was thrown into actual production on the Star Wars Rebels TV series, with fast-paced tv deadlines to hit and projects to finish. It was also on a much smaller scale, as I was the only intern on a team of 40 or so, as compared to the MUCH larger Disney. They were both incredible, and I learned very different things from each. How do you think you have grown from your experiences at two of the biggest animation/vfx studios of all time? Wow. That’s a loaded question! One of the biggest things I learned from working at these places was how important it is to stay humble and teachable. Even though those studios are crammed from wall-to-wall with some of the best talent in the world, everyone I met felt as lucky and fortunate to be there as I did! They never stopped learning or working to keep that feeling of wonder alive. As a result of my experiences, I have a renewed desire to work harder, but want to make sure I’m always kind and teachable. We are all learning, and will hopefully never STOP learning. The moment you feel like you “know enough” and stop actively trying to progress, you’ll quickly fall behind! Clearly you are a pro at getting huge internships by now, so do you have any tips or words of wisdom for the rest of us who want to apply? Haha! I certainly wouldn’t call myself a pro! I feel incredibly fortunate to have had these opportunities, and I still feel like I’m no different than all the other incredible friends and classmates I work with everyday. So much of my opportunities just came down to fortuitous timing. I guess if I had to give any tips, I’d honestly say the most important thing to do is just be nice! We all know that our work has to be top-notch, but in such a competitive industry sometimes it’s easy to forget that just as important as what you know is WHO you know. I don’t mean that in a sneaky, “sweet-talking” sort of way. Quite the opposite. I just mean always being genuine and kind to people. I’ll always try and take time to help my classmates, not only because it’s the right thing to do, but I know someday we will probably be working together! The animation world is SUPER small, and when your name comes up during an application, you want someone in the room to be able to say, “Oh ya! I went to school with _______. They were always a great team-player.” I’ve talked to recruiters about this quite a bit, and they’ve said they’ll take ability to work well with people over just raw ability every time. So work hard, but BE NICE! Thank you so much for chatting with us Dylan and best of luck in the future! In this clip from Advanced game animation term, JP Rhinemiller critiques a student's shot and highlights the importance of adding interesting transitions in game animation. During most terms, AnimSchool offers a free art class open to all of the students. In this term's Character Design class, Art Director and Visual Development artist Matthew Boismier explains the importance of making characters relatable. In this clip from a class lecture, AnimSchool instructor Kent Alfred talks about basic jumping and spine reversal and the how the latter helps to sell force in the jump. In AnimSchool's Intro to 3D Lighting class, Blue Sky Studios Lighting TD Brandon May explains how lighting can be used to help the storytelling process. Carlos Rivas was one of our most helpful students. He would always give his support to his classmates and would never hesitate to share his resources. It was a delight to interview him. Carlos tell us about yourself and your background. I am a Peruvian and I live in Lima City. Ever since I was a child, I have been in love with cartoons and especially “The Simpsons” series. I am a huge fan. I also remember how I loved watching the making of the show, “Woody Woodpecker” after each episode. I was always amazed to see those drawings come to life and take on personalities to become characters that would make me laugh. I spent a lot of my childhood time drawing cartoons on the corner of my books during lectures. Later I started using flipbooks to draw characters and had fun going back and forth drawing and feeling like a director. I also like music and acting. I love watching movies in cinemas and studying them for better acting choices and compositions. I love to travel in my free time as well but that doesn’t happen as often as I’d like. So what motivated you to join the 3D animation field? When I finished school I wasn’t sure what I was going to study, I knew it had to be something related to drawing or design. While I was deciding my field, Shrek got released and instantly became the talk of the town. Everyone was talking about it and when I got a chance to watch it in the cinema, I instantly fell in love. I had to know how it was all made. They were not just drawings so I started my investigation and that was the first time I learnt about 3D animation process. In Peru, we had no proper teaching program regarding this field so I started searching for local 3D studios to join and learn everything related to it. I signed up with one that provided me a basic level of understanding for all areas of 3D field like modeling, rigging, animation, texturing, lighting so I learned a little bit of everything and I realized that animation was the one I enjoyed the most so when when studio needed interns for only animation, I signed up. This gave me a chance to learn from the local talented animators and I had a great time there. It was a dream come true when I worked on my first animation movie there. What made you decide to join AnimSchool’s animation program? After we finished the movie, I realized that even though I knew more about animation than ever before, there was more to this field. It’s like a rabbit hole. There is always room for more knowledge and improvement. So I knew I had to reach next level. I started considering my options and checking the local community when I met a friend who was learning from an online school. It was like a perfect solution. I could learn from animators working in top studios from my home. I was excited. I chose AnimSchool because I liked their students showcase. AnimSchool also offered qualified teachers, live clases and general reviews. I couldn’t ask for more and joined it. How did the instructors help you hone your animation skill? First of all, I was amazed by the level of dedication and patience my instructors showed in all of my classes. It was refreshing to meet teachers that were this much invested in what students were doing and were genuinely trying to help and make them animate better. For me, term 4 was a break through. I knew many things before, principles and all but they clicked during this term. My instructor Trevor Young and atrium runner Nigel Style helped me see lots of tiny, tiny things that I had no idea about. Their critiques and feedback pushed me further. There were a lot of resources at my disposal and I was.. I was super excited. I couldn’t ask for more. It was awesome. Tell us about your workflow? It depends on my shots but since I mostly handle dialogue shots, I’d discuss it here. First I listen to the audio again and again to get the feel of it. If there is a storyboard, I’d take a look at it too. These two help me get an idea of character and how he should act. After this I shoot reference. This is where I play with different acting choices and let the creative ideas flow. I then take a look at what I shot. I cut and join different footage together to get what I want. Now is the time when I sit and, based on my acting choices, draw thumbnails. I draw only story telling poses and push them to get strong and clear line of action. Once I am happy with my thumbnails, I move to Maya and play with rigs and cameras. After I am happy with my set up, I start posing my character in 3D based on my drawings and see if they are working. When I am happy, I add more poses and keep on adding till I reach 4’s (one pose for every four frames). This is the time where I hit spline. Now the first thing I do is to hide arms. I work only with body for couple of hours to make sure mechanics are working and performance is clear then I put them back again and start polishing it all together. I polish facial expressions and lip sync in the end and get the performance that I want. I always make sure to show my work in progress to others at each stage. It is really important for me to get feedback of other animators. Their fresh eyes help you see things that you might not be seeing because your eyes have gotten used to seeing the scene. You met us when you came to receive your graduation certificate. How was your experience, going to America and attending CTN? CTN 2014 was everything I expected and then some more. It exceeded my expectations and I tell you, I had HUGE expectations to begin with. It was an adventure I will never forget. I got the chance to meet AnimSchool crew and instructors first time in flesh and blood. It was amazing. I met all my online fellow students which was really cool. 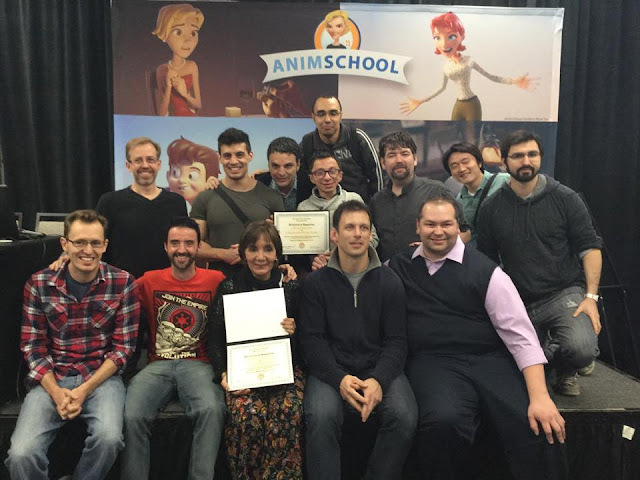 Graduation ceremony with David Gallagher, AnimSchool staff, and students at CTN booth. I met many talented directors, animators, modelers, sculptors but nothing beats the time I met Glen Keane. I was awestruck. It was interesting how it all happened. I was very disappointed that I couldn’t buy ticket to his workshop because they got sold out so quickly. So I got ticket to another workshop and as I was walking down the hall, a guy who looked like Glenn passed me. I didn’t realize it was him till after like 40 frames. I turned and tried to catch up with him all the while thinking: "please be Glenn, please be Glenn". When I got closer, it was Glenn and at that time I just stopped thinking. I was that pumped. I put myself right in front of him and popped my hand out and with a huge grin on my face, I said, “Hi!!”. I just had to. Haha. He stopped and he was very nice. He shook my hand and said, “Hi”. Then he started to chat and we talked for about 5 mins. He gave me an autograph and I took a picture with him. It was so so cool. I still can’t believe I met him. So glad I have this photo. 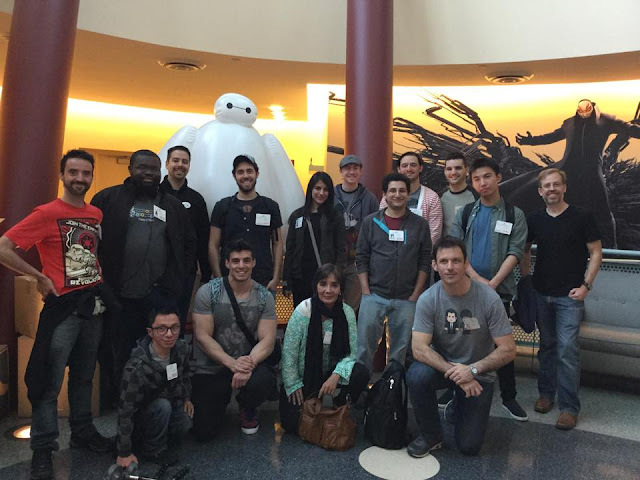 AnimSchool instructor Tony Bonilla arranged a Disney Studio tour for all the AnimSchool students. It was incredible and the whole time I was super happy. I couldn’t believe I was at THE Disney Studios. I met animators and AnimSchool instructors that were working there. They arranged screening of Frozen’s short film for us. I also saw sneak peak of Zootopia that was in production that time. Being at Disney Studios, among Disney animators was everything I ever hoped for. It was amazing. Peru animation industry is slowly gaining momentum. After finishing AnimSchool, my friends and I founded our very own studio called “Golem Studio”. In our initial years, we worked on Tv Spot and Tv Series and currently, we are working on our first film called “Dalia and the Red Book”. It is a co-production with “Vista Sur” of Argentina. It is in its initial phases. With this project in our hand, we want to demonstrate that not only Peru can develop great stories but has CGI industry advanced enough to handle the technical aspects of it as well. We want to expand what CGI industry we have in Peru to all the Latin American countries. Of course, we want our Golem Studio to evolve, expand and become the best studio of Latin America in the production of 3D movies. We look forward to colleaborations with other big studios and we are glad that we are on the right path. I am also teaching animation at a local institute in Peru. The vision I share with other Peruvian animators and digital artists needs to have a steady stream of young artists to grow and expand. I am very thankful to AnimSchool for teaching me and helping me reach this point in life where I am giving back to my small community. We have a long way to go but I am part of this amazing journey and I couldn’t be happier. Is there any advice you want to give to the aspiring animators? Don’t be shy. Ask for feedback all the time. There is no shame in asking and the way animation is, you have to constantly get feeback and critiques to improve on it. This is important if you want to take your shot to next level as well.